Standard invitation and RSVP sizes for envelopes. Download this pdf for all sizes. Another term used for promotional products, imprinted shirts, embroidered polo shirt, pen, mug, water bottles, etc. Against the Grain Printing a sheet of paper at right angles to the grain direction of the paper, as opposed to with the grain. Sometimes called cross grain. Anti-aliasing The process of averaging between pixels of different colors. This results is a smoother, more blended transition between the edge of two areas rather than a distinctly jagged appearance. Artwork The original physical materials, including photos, graphic images, text and other components needed to produce a printed piece. Can also now refer to the electronic or digital components needed for preparing a printed piece for production on a press or copier. Ascender Any part of a lower case letter which rises above the main body of the letter such as in “d”, “b” and “h”. Base line The imaginary horizontal line upon which stand capitals, lower case letters, punctuation points, etc. Bleed Any element that extends up to or past the edge of a printed page. Bond Paper that is suitable for writing, printing and typing. It is erasable and somewhat rigid. Stands for Coated One Side (C1S) cover stock (C2S). A glossy finish on one side and uncoated on the other (easier for writing on), usually 10pt, 12pt or 14pt in thickness. (no carbon required) and usually comes in 2-part, 3-part and 4-part. Center spread Two pages that face each other in the center of a book or magazine. Coated stock Paper that has a coating applied after the paper is made, giving the paper a smoother finish. Color separations Separating PMS colors or CMYK colors for printing. This will create the separate plates needed to printing on a press. Cover Type of paper used for the covers of programs, pamphlets, etc., also used for business cards and postcards. Coverage The area that ink covers the surface of a printed sheet. Usually expressed as light, medium or heavy. Crop To “cut out” part of an image and show only the desired portion of the original. Crop marks Small printed lines around the edges of a printed piece. These marks indicate where the edges of a document are to be trimmed. Cyan The “blue” used in four-color process printing. The C in CMYK. Also referred to as process blue. Die Cutting Cutting paper in a shape or design by the use of a steel block which is positioned in the shape of the desired pattern. Dies are used to created rounded corners on business cards. The initial cost is for the actual die is a one-time cost, then the cost to shape each piece. Drill Holes into paper for ring binding. Also known as 3-hole punching. Dull finish A semi-gloss finish on paper that is less glossy than gloss and more than matte paper. Also known as silk finish. Dummy A hard copy print out that is the reproduced desired finished product, also called a comp. EPS Encapsulated Post Script. A standard file format used to transfer postscript formatting information between applications. Also known as “vector art” and can also be saved as an .ai file.When in vector form, it can be scaled to any size without losing sharpness. Ganging The combining of two or more different printing projects on the same sheet of paper. Grain The direction of the paper fibers. Printing is usually done so that if folding is required, the fold is done parallel to (or “with”) the grain. Indicia A mailing permit that is set up with the USPS and pre-printed on mailing envelopes in place of a stamp. Pronounced in-dee-sha. Leading Space between lines of type. The distance in points between one baseline and the next. Magenta One of the four process colors, or CMYK, the M is for magenta. Magenta is a predominately red/pink color. Matte finish A coated paper finish that goes through minimal calendaring. Natural A term to describe papers that have a color similar to that of wood, also called cream, off-white or ivory. Offset printing Printed material receives ink from an intermediary blanket that receives the ink from the plate and then transfers it to the paper. Perfect Binding A binding process where the signatures of a book are held together by a flexible adhesive. Plastic Coil Binding Plastic wire is spiraled through holes punched along the side of a stack of paper. Commonly used for reports, proposals and manuals. Documents bound with coil have the ability to lay flat and can rotate 360 degrees. Also called spiral binding. PMS The abbreviation of the Pantone Color Matching System. Point A measurement unit equal to 1/72 of an inch. 12 points to a pica, 72 points to an inch. A system where a color image is separated into 4 different color values (cyan, magenta, yellow and black or CMYK) then transferred to plates and printed on a printing press. Registration How an image on one side of a printed sheet aligns with the image on the other side. RGB The color space of Red, Green and Blue. This is what your monitor uses to display color. An RGB computer file must be translated into the CMYK in order to be printed. Many times, what looks like bright blue on your monitor (displays in RGB), prints in a purple-ish color when converted to CMYK. Saddle stitch The binding of booklets or other printed materials by stapling the pages on the folded spine. Scoring To crease paper to making folding easier and prevent cracking. Self cover A booklet whose cover is the same paper stock as the internal sheets. Signature A printed sheet with multiple pages on it that is folded so that the pages are in their proper numbered sequence, as in a book. Stock A term for unprinted paper. Click here to read more about paper types. Text paper A high quality light weight printing paper. Trim marks Marks placed on the printed sheet to indicate where cuts should be made. Trim size The final size of a printed piece after being cut from the sheet of paper that it was printed on. Up A term used to describe how many similar pieces can be printed on a larger sheet; two up, four up, etc. 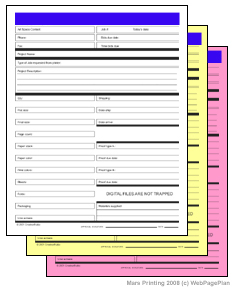 Variable Data Printing Is a form of on-demand printing in which elements (such as text, graphics, photographs, etc) can be changed from one printed piece to the next, without stopping or slowing down the press, using information from a database. For example, a set of personalized letters, each with the same basic layout, can be printed with a different name and address on each letter. Widow A single word or two left at the end of a paragraph, or a part of a sentence ending a paragraph, which loops over to the next page and stands alone. Also, the last sentence of a paragraph, which contains only one or two short words. Yellow One of the four process colors of ink, or CMYK. The Y is for yellow. Zip file Zipping a file compresses one or more files into a smaller archive. It takes up less hard drive space and less time to transfer across a network or the internet.